Every year there are lots of changes that affect every school in the country. Changes range from Ofsted requirements for your school website, through technology changes that make more and more exciting things possible. All the way to the latest trends in design. So, what are the latest trends in school website design 2018? What's on trend in school website design in 2018? Audience focused design - Five years ago (yowsers!) 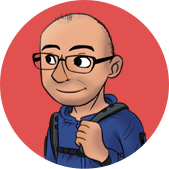 I wrote a blog post entitled Why pencil buttons on school websites are bad. More and more schools understand that, especially for primaries, children aren't the main audience for your school website. Your focus should be on parents and prospective parents. They don't want to see cartoons and pencil buttons, they want clarity of navigation and easy access to the information that they're interested in. Greater focus on life in school - your audience is looking for specific information; term dates for example, should be incredibly easy to locate and read on any school website. If you're trying to engage your parents and prospective parents, one of the greatest things you can do is celebrate all the amazing things that go on your school day to day. It will engage your main audience and will be of great interest to inspectors as well. Ease of use crucial for inspectors (and everyone else for that matter) - your site structure is so important as part of your school website design strategy. More and more reports are coming in advising that inspectors are placing a greater and greater emphasis on ease of use. It's absolutely right that inspectors should be able to find what they need easily. That said, accommodating inspectors needs isn't first priority day to day. But the same principle applies for all of your audience. A great school website partner will help you make sure your structure is easy to follow, no matter who the stakeholder. How do I stay current if I don't want to overhaul my entire website? There's plenty you can do if you're not in a position to completely change your school website. The options below should be available to you and the technology you have in place shouldn't get in the way. Social media engagement - Do you have no options to tie your website and your social media channels together? If so, taking the time to post important info such as news and events is a brilliant way to engage. Add photos & video to your content - there is no better way to bring people into your content more and more than using photos and video. If you're posting a news article about a special event, media will bring it to life. Parents mostly just want to see what their children have been up to in school. Share that content creatively. It's worth the effort. It should be time-consuming, it should be very quick and straightforward. If that's not the case add just a couple of photos because it will still make a difference. Keep on top of your content - so many schools effectively give up because it such hard work to keep on top of things. Two things that hopefully motivate. Firstly, it's not unheard of for inspectors to write off a school before they even get to the door. The reason? Because the website is so bad. Secondly, your website is the single best way of attracting new parents to your school (perhaps behind word of mouth). So share stories about the great things your students are achieving. Keep telling those stories and you'll be doing more than most schools still are. 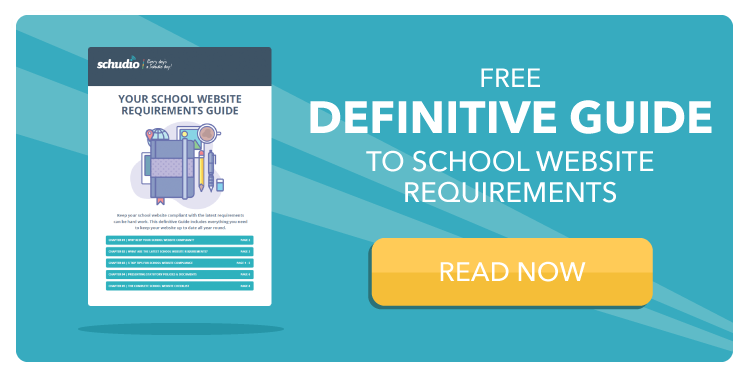 Read the definitive Guide to School Website Requirements. The Schudio School App - completely free way to engage your school community. Share news, events, term dates, blog posts, social accounts, contact details and much more. How will new technology affect school website design in 2018? More and more tech to make compliance easy - expect to see tools to assist you in your website compliance. Like our School Website Compliance Software, which we'll develop more over the coming months. Plus, expect more features to help you effectively display and monitor your policies and statutory information. Greater creative control - expect integrated options for controlling creative content such as image editing, integrated app options, great options around video and more. Social media advancements - expect to see more and more control over how your engage with social media channels directly within your website package. You should also see more insights and advice around how you can use social media effectively within your wider marketing strategy. Natural multi-device integration - as an example, your website calendar should have the option for parents to subscribe to your calendars. More and more features will come out this year that will make it easier for parents to naturally engage with your school. There are so many exciting things that are coming up this year. It doesn't have to mean a complete change of provider but it's certainly worth chatting through what options are available to you. You critical focus should be on your audience and meeting their needs. If you ensure your statutory content is in place and you keep pages like your term dates up to date, spending your time sharing life in school in a creative way will see you reap the rewards during the coming twelve months.